Pobitora Wildlife Sanctuary is situated in the about 50 km from Guwahati city in the Morigaon district. Pobitora is one of the major wildlife sanctuaries of Assam. Covering an area of 15.9 sq. 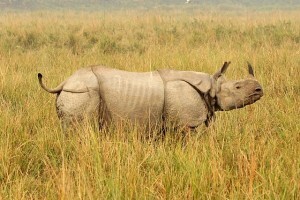 km Pobitora is mainly famous for its great Indian One-Horned Rhinoceros. Besides, the other animals are Asiatic Buffalo, Leopard, Wild Bear, Civet Cat, etc. More than 200 birds and various reptiles are found in this sanctuary. The forest department has an Inspection Bungalow inside the forest. Visitors intending to visit Pobitora can visit can Guwahati also. Best season to visit is from November to March. This entry was posted in Assam, Pobitora Wildlife Sanctuary. Bookmark the permalink.